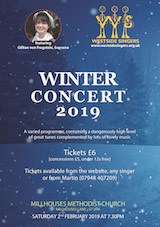 2 February 2019, a Winter concert at Millhouses Methodist Church. 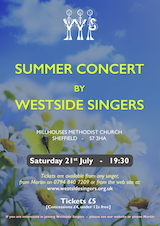 21 July 2018, a summer concert at Millhouses Methodist Church. 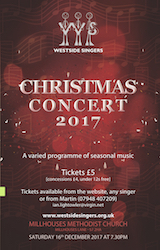 16 December 2018, a Christmas concert at Millhouses Methodist Church. 15 July 2017, a summer concert at Millhouses Methodist Church. 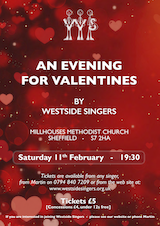 11 February 2017, a Valentine's concert at Millhouses Methodist Church. 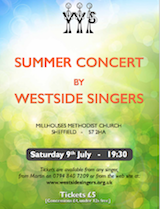 9 July 2016, a summer concert at Millhouses Methodist Church. 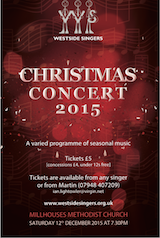 12 December 2015, a Christmas concert at Millhouses Methodist Church. 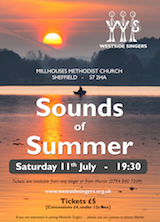 11 July 2015, a summer concert at Millhouses Methodist Church. Here is a selection of photos taken by Nigel Thomas - care, large file. 13 December 2014, a Christmas concert at Holy Trinity Church. .
12 July 2014, a summer concert at Millhouses Methodist Church. 15 December 2010, a Christmas concert at Fulwood Old Chapel. Our very first public concert.